Gfest: Battle of the Lantern Corps Pumpkins - Which is Cooler? Battle of the Lantern Corps Pumpkins - Which is Cooler? Today we present to you an epic battle between two incredibly cool sets of Halloween pumpkins carved in the shape of the symbols of the various lantern corps. The first was done by Grace Belancik (a.k.a. 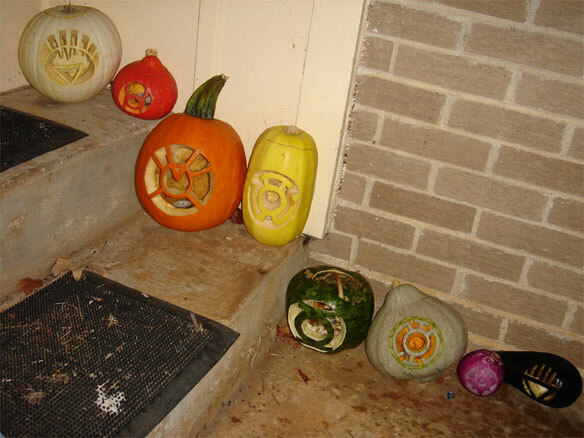 DeviantArt user RocketGirluvsUkitake) who was creative enough to branch out beyond pumpkins and instead find either colored pumpkins or other foods that were the appropriate color for each corps. The second set was sent to us by Jillian Sarro who made them with her boyfriend. (by the way dude, nice catch. Hold on to her for that Wonder Woman costume alone). 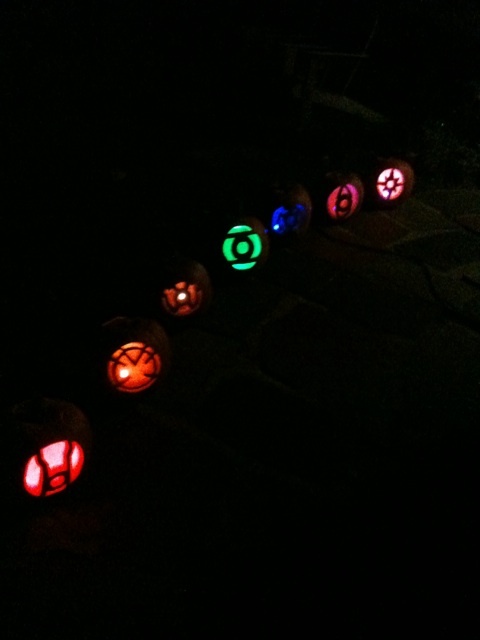 They found away to have each of their lantern corps pumpkins lit up inside with the appropriate color for each corps. Can you spot the Black Lantern Corps pumpkin? Didn't think so. The brain trust behind gfest is officially split between which set is the coolest. So we decided to settle the bet by throwing it open to you. Tell us in the comment section which one you think is cooler. Halloween is a night time based holiday, so I would vote for the lit pumpkins. Although they are both pretty damn cool. I think the presentation of the lit ones is better and I like how they are all similar sized. While I admire the creativity of branching out to different types/kinds of pumpkins, I gotta go with the lit up colored ones. Matt, you are the Picasso of pumpkin carving! Based on the look..I would for for lit up. But I am sad, both sets are missing certain lanterns. The first set has The Black Lantern symbol on a white pumpkin with no White or Indigo Lanterns. The second set is also missing the White Lantern and I assume the Black Lantern is there but its...well black.